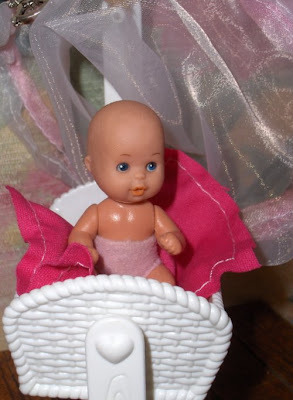 Not too long ago I found a sweet little baby cradle at the thrift store. 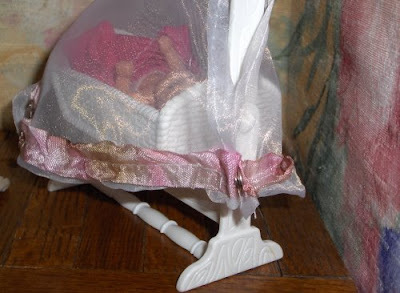 There was no mattress, no veil -- just a plain plastic cradle. I knew we'd fix it right up! The picture above shows you the view from the baby's head end of the cradle. 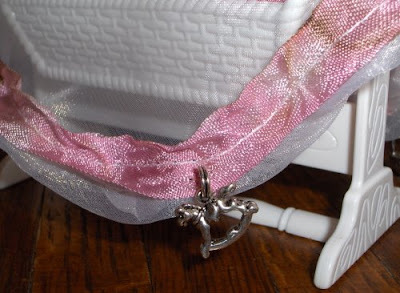 I cut this clear piece of material to fit loosely over, hemmed it, added some antique-looking ribbon trim and then put a snap closure so my daughter can close it snugly around the crib. Mosquitoes drive the dolls crazy sometimes. 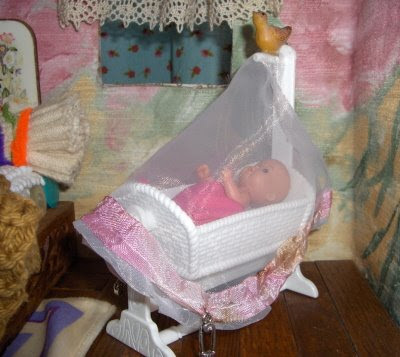 When baby wakes up, the veil can easily be placed back out of the way. 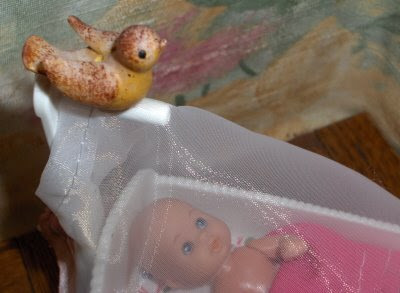 The make this light, airy material hang down arond the cradle, we sewed on two pretty card decorations I had at my art desk. The veil was placed evenly over the little post at the cradle top and hot-glued into place with just a small drop of glue. This little birdie was also hot-glued into place. The baby loves watching the little bird. Baby, of course, sleeps in mommy and daddy's room. They want her close by.